In a dollars a cents sense, we now have a pretty good idea of who the biggest Beatles fan in America is. Indianapolis Colts owner Jim Irsay is reportedly said by Rollling Stone to be the high bidder for the drum kit Ringo Starr played in more than 200 performances and a Rickenbacker guitar that John Lennon gave Ringo. 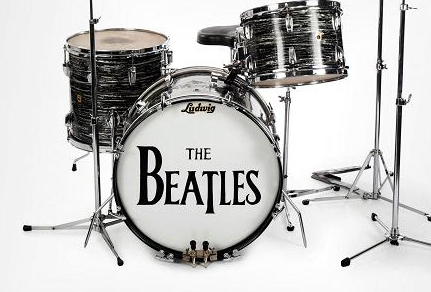 Irsay, who already dropped over $2 million to buy the logoed head from the bass drum Starr played when the Beatles appeared on the Ed Sullivan Show, paid about the same amount for the full kit. Yeah, Yeah Yeah... it IS a little like paying as much for a hub cap as the whole car cost, but Irsay probably feels no buyer's remorse. The NFL owner has now acquired an historically significant personal piece from all four members of the band - and he probably has enough left to commission automatrons of all four and stage a Beatles half time set during a Colts game. Another high flying bid the weekend Julien's Auction brought out was a $790,000 one for Rongo's personal copy of the band's double album of 1968. It was the very first pressing of The White Album, as it came to be known. It's former owner had a pretty good idea of its value. Starr kept it stashed away in a bank vault for decades and says the pristine album still has his fingerprints on it. All told, the auction raked in more than $9 million dollars, some of which will go to the charitable fund Starr and his wife Barbara Bach established.